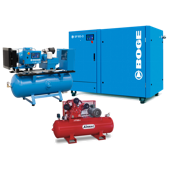 Silent, compact, and extremely efficient the space saving directly coupled screw compressors of the Boge C L series are designed for very efficient economical operation and are equipped with optional horizontal receiver and/or mounted refrigerant dryer to be flexible and adaptable to the individual requirements of the respective situation of application. Airmac air compressors leverage the proven Fusheng air compressor pump for reliability, access to air compressor spare parts and to minimise total cost of ownership. The Japanese made FS-Curtis FAC Series of diesel air compressors are available in trailer mounted models as well as box type configurations. Multiple axle options are also available for offroad use or specialised air compressor projects. 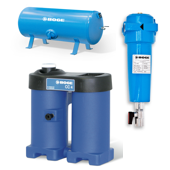 A space saving Boge C-series screw compressor is designed for long-term performance. A refrigerant dryer mounted on a horizontal receiver is available as an option. 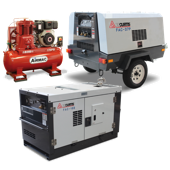 The Japanese made FS-Curtis FAC Series of box or skid type, portable diesel screw compressors. The Bluekat oilfree screw compressor series is engineered to produce class 0 oil free air. Located on the northside of Brisbane providing the best products and the highest level of air compressor service you will find in the greater Brisbane region servicing South East Queensland including Dalby (South Burnett Region), Toowoomba (Darling Downs), Kilcoy and the Gold Coast. With years of experience in providing effective solutions including service of rotary screw compressor systems for hundreds of organisations and countless applications, you can rest assured that Enerquip will supply first class, guaranteed and innovative solutions for your air compressor requirements. Whether you need help to set up your factory compressed air requirements, or require technical assistance, Enerquip product specialists will ask questions to gain an understanding of your application and requirements. Then they will plan for you, and take action to provide you with the most efficient and effective air compressor solutions. So if you’re looking for the best compressed air machinery, and you value Service + Reliability by qualified, experienced professionals, contact Enerquip today.